Person with disability should be provided with a quality education just the normal person. Though, they are incapacitated partially of some of the senses and physical features of their body, yet they should be provided with education specially designed for them. To realize this, there should be special people with a special love and care for them. In La Carlota, Negros Occidental, PH, there is a special education integrated school for special kids. Children with disabilities like hearing impaired, mentally challenged, visually impaired are considered as special children. Since they are special, they should also be treated by a special parents who have the love, the care, and the patience to provide them education as what the normal persons are enjoying. These children have the right to be educated as what the PH constitution so provides, "The State... shall take appropriate steps to make such education accessible to all." This school is celebrating her 10th founding anniversary of hope, love and inspiration to humbly be grateful to the Almighty God and to their benefactors who supported her without reservation to deliver the quality education which their special pupils. A touchy testimony of a hearing-impaired pupil has made everyone realized the importance of taking care of those special children. Titus John G. Divinagracia, a hearing impaired elementary pupil o the SPED delivered his speech through a sign language while his message was flashed at the big screen. "People like me will not be here without people like you. Life for us is not easy, yet we are part of this society. Each day we keep on doing our best, to reach for our dreams and be blest. To say a word for us is a great achievement. To see you stick with us is your commitment. You helped us understand that education is important. We're thankful. 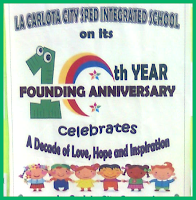 La Carlota City SPED Integrated School was born. Ten years had passed and more years to go, you have seen and heard us today. Others are coming too. Yes, you call us SPECIAL for there are things we cannot do - Yet our hearts are sincere asking you to teach us so. WE ARE HERE because of PEOPLE LIKE YOU." "I started teaching the deaf in 1994 at Pontevedra, Negros Occidental, an outreach program of Welcome Home for Literacy. I learned how to deal children with special needs. 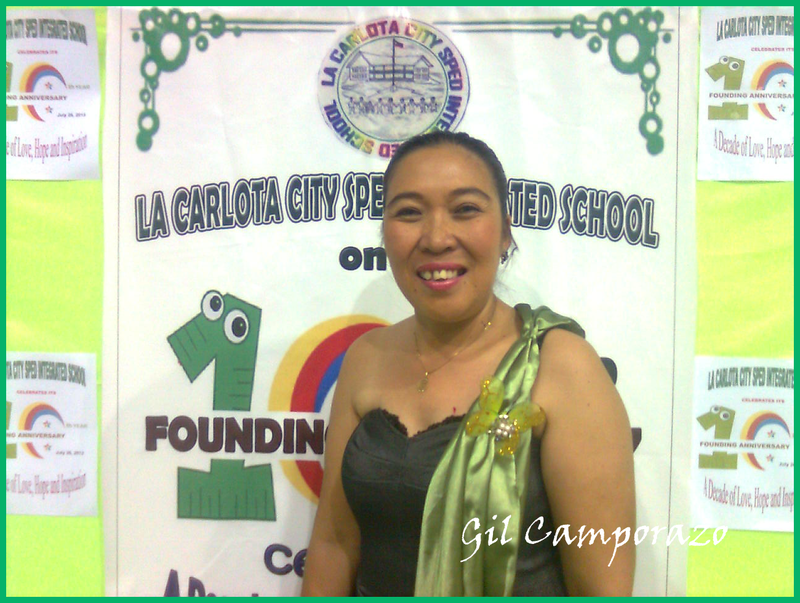 "In 2003, the late Dr. Norma C. Dorone, the schools division superintendent of La Carlota had a plan to put up SPED in La Carlota. It was a blessing in disguise that I came over to North Elem. School to visit Miss Analiza Bionat to inquire about it. Dr. Rosario Arranguez interviewed me and we came to division office to see Dr. Dorone. Upon knowing my teaching experience on special children, Dr. Dorone immediately facilitated the process of my application. "In June 2003, I started teaching 9 deaf pupils in Grade one. Now they had already graduated in high school and they are studying at WHFL. "Teaching them is not easy. It needs your patience and love. It is more difficult if their parents are not supportive for they don't know their responsibility for their special children. I have to visit and encourage them to let their children go to SPED school. Their parents keep on insisting not to let their children go to school for they don't know how to speak according to their doctor. Others said that these children are not productive. It will be a burden to them. They don't realize that it is for the betterment of their children's future. I appreciate those parents who understand and accept their children as special. "I realize that my heart belongs to them. I love them and I think this is my vocation. I am proud to be a SPED teacher. "After a year, the school opened another classes for disabilities such as mentally challenged, hearing impaired, and visually impaired with 6 teachers. Every year, the enrolment increases. In 2005, the school was official recognized as SPED CENTER. Congressman Jeffrey P. Ferrer who was the city mayor at that time, converted the 6-room sports complex into 6 beautiful classrooms. In 2009, the Center became an Integrated School with the concerted efforts of Mr. Avelino N. Santillan and SDS Juliet A. Jeruta. "At present, the SPED-IS has a total enrolment of 154. "In 2011, the school received 11 sets of desktop computers with complete accessories from DTI 6, 6 Computer tables from M. Lhuiller. One classroom with aircon was constructed through Mayor Juliet Marie Ferrer. In Feb. 21, 2013, 1 set of Samsung personal computer with projector and screen was donated through Adopt-a-School program of the DepEd by DepEd Secretary Armin Luistro. A downloaded fund of Five Hundred Thousand Pesos (Php 5000,000.00) was also received by the school from the national budget. "Parents with special child are special parents chosen by God," she concluded. Vice Mayor Jacky Jalandoni in behalf of Mayor Juliet Marie Benedicto of La Carlota: "Having special or differently able children is hard for parents and for the whole family but even harder in a bigger society. 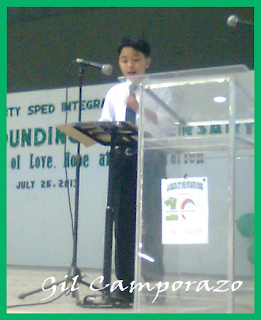 However, that challenge was faced and triumphantly crossed by the La Carlota SPED integrated school. They have given the proper and needed education and nurture for these children. This is an educational triumph that cannot be rewarded by money nor any material things. This is a perfect picture of pure passion and vocation. "We have reached the time when these children are no longer treated as objects of scorn or shame. In fact, we have accord them dignity and realize, they too, have something to provvide in the community. We are giving hope to them, to their parents, that they are not just extra baggage to be carried on. We have provided them venue for finding worth for themselves. And this is a great success." In a statement, Representative Jeffrey P. Ferrer of 4th Congressional district of Negros Occidental said: "Our task is to continue the success of the La Carlota PSED Integrated School. 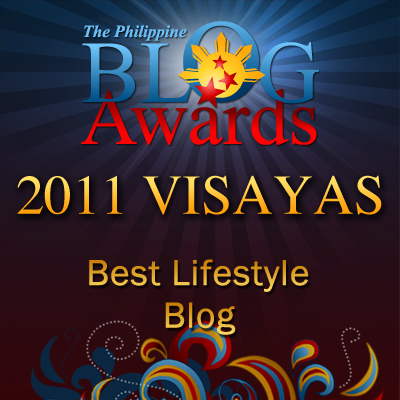 For this year, they are celebrating a decade of LOVE, HOPE & INSPIRATION. The government has always been there to provide support. And we as leaders through the mandate of the people, profess to pledge our helping hand in whatever concern we shall face for the safety and happiness of the young. Republic Act 760 aimed at protecting the children from all kinds of abuse. In fact, La Carlota City Code for children has been there for two (2) years now to write in the tablet of our law. Our sentiments for the welfare of the children. we are one in lifting the conditions of our children because they are our future and we commend the zeal of the parents and teachers to these children to freedom. Freedom from neglect, abandonment, hunge, ignorance, abuse and exploitation." "Without your passion for these children, you will not be able to triumph against all odds. You have made history by standing on your beliefs... I salute you! "You have given a lot of yourself to these children, sort of laying down your life for them. You have given them your life, your time, your heart. "Do you know that when God measures a man, he puts the tape around the heart instead of the head. By your deeds, you will pass master, and will have special place in His heart." La Carlota Schools Division Superintendent, Dr. Portia M. Mallorca congratulated everyone for the success of the SPED integrated school. 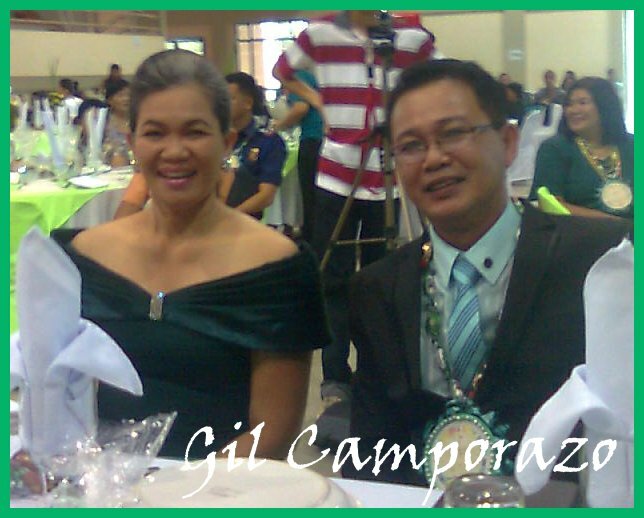 Former ASDS of La Carlota, Mr. Ferdinand S. Sy graced the affair and he was one of those who received the plaque of recognition. Former school principals of La Carlota North Elem. School, who had managed the center before like Mrs. Teresita Panes, Mrs. Melba N. Canet, Mrs. Zenaida Gahaton, Dr. Ruth Convite, and some stakeholders were given certificates of recognition and appreciation. Recognized also were SPED teachers, workers, and others who had contributed so much for the success of the school for a span of 10-year continued service to the special children. Some elementary and secondary school principals and retired supervisor showed their support too by their humble presence. And also some barangay captains and city councilors were present. SPED teachers and non-teaching opened up the program with their production number. Some selected SPED pupils displayed their dancing, singing talents too. Kids' shadow theater presentation wowed the audiences and the visitors. Lingaw-Lingaw dance group led by Division Administrative Officer V, Ruth F. Villanueva provided also the entertainment with their two popular dance number, My youngest daughter, Geeree, ALS instructional manager, was one of the dancers of the group that performed. The dinner is superb. It's fulfilling and satisfying. Everyone went home with some tokens to bring. More power, La Carlota Special Education Integrated School! I am totally in salute of the teachers, principals, other educators and coordinators of the institution as they help these kids. Happy 10th anniversary to La Carlota Sped IS and more power for the years to come. It's nice to see school progress further. More power indeed. Education is really vital in our society today. Even though a child is not rich being educated is far more better because that alone is his treasure which will surely last a lifetime. We all salute all people who devoted their time teaching. Happy 10th anniversary to La carlota SPED. I salute Sped teachers, their job is simply much harder and with extra commitment (i think). More power to La Carlota ELem School! I love the speech of Titus John, very inspiring. And to the people of La Carlota and SPED teacher, you are also an inspiration and good example to them. 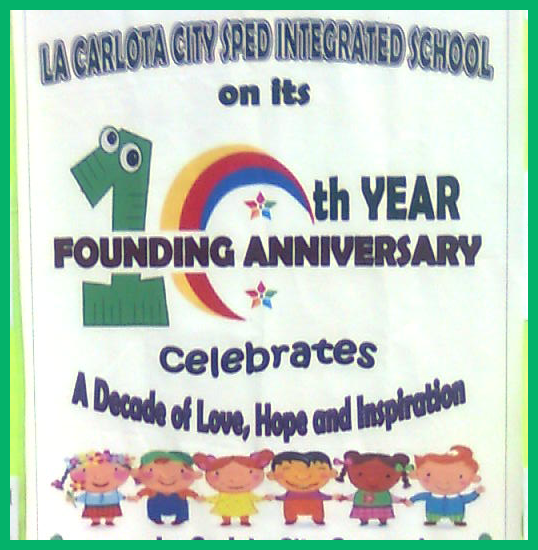 Happy anniversary and More power to La Carlota SPED! Kudos to all the teachers for the hard work and extra special effort you exert! No pictures of the food for dinner? Aww haha on other thought, the article centers on La Carlota SPED anyway. 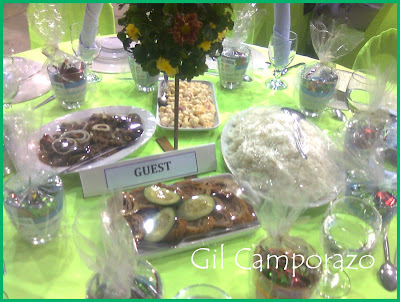 Congrats on your SPED Founding anniversary! double rise in sales negotiation. Now everyone can enjoy the fast and easy communication with smart gadgets. and masters of video poker thrive on the unpredictability that comes with betting against a machine.